(Inside Science) -- It happens to everyone. You are cruising down the freeway -- at the speed limit, of course -- when suddenly the traffic thickens and slows to a complete stop. When traffic resumes moving you note there was no apparent reason for the halt -- no accident, no detour, no construction. Hours of our lives are spent in these mysterious transportation clots, although nothing we experience matches what happened in China in September 2010, when the highway between Beijing and Tibet was jammed and came to a complete standstill for two weeks, possibly the greatest traffic jam in history. Most traffic jams are more mundane but still infuriating. The problem of random traffic jams on most roads, said Berthold Horn, an electrical engineer and computer scientist at MIT, is sometimes described as an issue of fluid dynamics. Other scientists point to chaos theory and fractals to explain the phenomenon. An analogy Horn uses is dilatant fluid, a fluid that gets thicker as stress is applied. For example, if you put enough corn starch into a swimming pool, you could walk across it on the surface. The content of the pool would remain a liquid but it would thicken under the pressure of your step. YouTube is full of examples, Horn said. The water in the pool is called a Newtonian liquid because no matter what you do with it -- shake or stir -- it remains a liquid. Once you add the corn starch, it becomes a non-Newtonian liquid and solidifies under pressure. Ketchup, incidentally, is the reverse. It is mostly a solid in the bottle until you shake or squeeze it, then it becomes a liquid. The non-Newtonian properties of ketchup are the reason it is so hard to get it out of a glass bottle. Now, think of the stream of traffic as a liquid. When you reach a certain number of cars in a certain area simultaneously, Horn said, the traffic "thickens," and everyone slows down because everyone is reacting to the car in front of them. Horn, thinks he has found the solution in luxury cars--adaptive cruise control, which uses radar to monitor the car ahead of you. If that car slows down, so does yours, in direct proportion to what the other car is doing. What Horn wants to do is watch the rear as well. 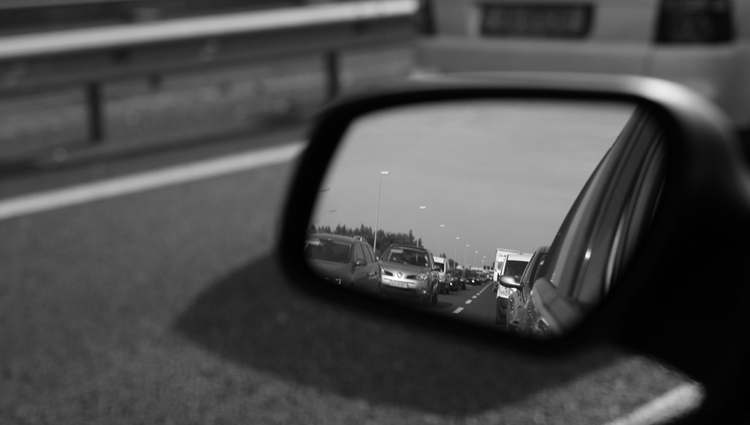 He calls it bilateral control: To keep traffic moving, you also have to look behind you. He presented the idea last month at an IEEE Conference on Intelligent Transport Systems in The Netherlands. "[T]his idea never came up in work on advanced cruise control, or the work on self-driven cars," said Horn. "And it's not that there wasn't an impetus to look for a solution." According to Horn, if you add radar in the back of the car to watch the distance and velocity of the car behind you, the cruise control would guarantee that your car would always remain half-way between the two. If every car did that, the vexing jams would never occur. That would turn the dilatant fluid into something more like the actions of a thick, sticky fluid, such as honey which is what efficient traffic should be. Your car would never slow down precipitously if the car in front slows, and the car behind would behave similarly when you slow. Variations in velocity--like the pressure in the swimming pool--are what cause the unexplained slowdowns. That, of course, would only work if all the cars on the road had back and front radar and adaptive cruise control, which they don't. The devices are still too expensive. Horn is exploring the use of digital cameras as a cheap alternative to radar, he said. Using digital cameras has a drawback; you usually need to look in stereo to measure distance. "It's hard to get the distance, and it is hard to get the velocity," Horn said. "Distance over velocity equals the time of contact." What you can get from a series of photos is the ratio between the two, which is what Horn is working on next. It may not be that simple, said Hani Mahmassani, director of the Transportation Center at Northwestern University in Evanston, Ill. In addition to the need for every car on the road to use these instruments, drivers already pay attention to the cars behind them, fearing they get rear-ended if they brake too abruptly, he said. Mahmassani also said Horn's solution might work if no one changed lanes and drivers never wove around each other. "Control logic that considers the car behind as well as the car in the front would dampen instabilities," he said. "It would unfortunately not solve our traffic problems because it does nothing about weaving and lane changing."